Home › Western marsh harrier › Hen harrier - Circus cyaneus. The hen harrier (Circus cyaneus) belongs to the family Accipitridae. 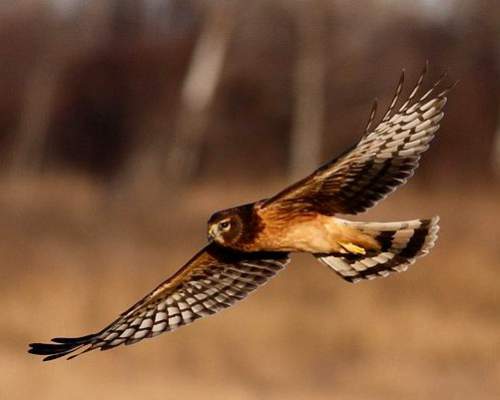 These hen harrier species are distributed in Asia, Indian Subcontinent, Europe, Africa and North America. Circus cyaneus is closely related to C. cinereus and C. hudsonius. Circus cyaneus and C. hudsonius were previously lumped as C. cyaneus. The hen harrier is a small bird, measuring 40 to 50 cm in length and weighing 300 to 400 grams. The female harrier is slightly larger and weighs 370 to 700 grams. The wingspan is 100 to 120 cm. The males and female harriers have distinctly differing plumage. The wings and tail are long. The male is mainly grey above and white below. However, the upper breast is grey like the upper parts and the rump is white. The grey wings have black wingtips. The female is brown above with white upper tail coverts and underparts are buff streaked with brown. The male call is a chek-chek-chek sound. The hen harrier inhabits open country like grasslands, steppe, meadows, moorland, bogs, prairies, farmland, coastal prairies, marshes and swamps. The hen harrier preys upon voles, mice, rats, ground squirrels, sparrows, larks, pipits, small shorebirds and the young of waterfowl. They also feed on frogs, reptiles and insects. The breeding season lasts from April to early July. The hen harrier builds nest on ground or on mound of ground vegetation with sticks and lines it with leaves. A single male may mate with several females. The females incubate the eggs and the male hunts and brings food to the females and the chicks. The hen harrier is distributed in North America, Europe, North and central Asia, North Indian Subcontinent and North Africa. The hen harrier is completely migratory, the birds in the northern regions migrating southwards for wintering. The hen harrier global population size is unknown given recent taxonomic split into Circus cyaneus and C. hudsonius. Considering the extremely large range, these bird species are least vulnerable. Habitat modification and pesticide use are the main threats to the survival of these bird species. The IUCN (International Union for Conservation of Nature) has categorized and evaluated these harrier species and has listed them as of "Least Concern". Current topic in Birds of India: Hen harrier - Circus cyaneus.